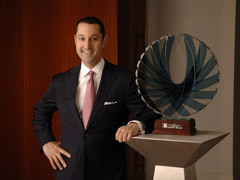 Jonathan S. Blue is Chairman and Managing Director of Blue Equity, LLC. As Chairman of Blue Equity, Blue has overseen all acquisitions, operations, organic growth and ultimate liquidity events for several Blue Equity portfolio companies, including the successful roll-up and sale of the nation’s largest Spanish directory publications to Telmex International. In 2005, Blue formed BEST (Blue Entertainment Sports Television). He was successful in growing it—through ten acquisitions—into one of the world’s leading sports and entertainment firms, which was acquired by Lagardère-Unlimited (MMB: EN Paris) in 2010. Most recently, Blue led the acquisition of Cool Petroleum, the licensed operator of Shell brands in Jamaica and one of the largest corporations in Jamaica. He was successful in rebranding the company as The Antilles Group Limited and it was sold to the Rubis Group (NYSE Euronext Paris: RUI) in 2013. From June 1998 until he became involved with private equity investments, Blue served as Vice President for Progress Rail Services Corporation, then a subsidiary of Progress Energy, Inc. (NYSE:PGN), which was subsequently sold to Caterpillar Inc. (NYSE:CAT). For six years prior to the 1998 sale of Louisville Scrap Material Co., Inc. and its affiliate companies, Blue served there as Senior Vice President, Rail Services. Responsible for worldwide business development of railroad and rail-related services, he succeeded in establishing these companies, collectively, as industry leaders. Blue began his post-college career as a Senior Associate for APM, Inc., in New York City, a leading international management consulting firm. Blue received a B.A. in Economics from the University of Pennsylvania in Philadelphia. A frequent public speaker, Blue has been profiled in many national and international publications. His ideas and views have been featured in The Wall Street Journal and New York Times. He has been interviewed on Bloomberg Television and CNBC. Blue has served on numerous professional panels relating to private equity, sports and entertainment, family offices, and a variety of other business topics. Blue is actively involved in several civic and charitable activities and participates in triathlons throughout North America. Copyright © 2005-2019 Blue Equity. All Rights Reserved.